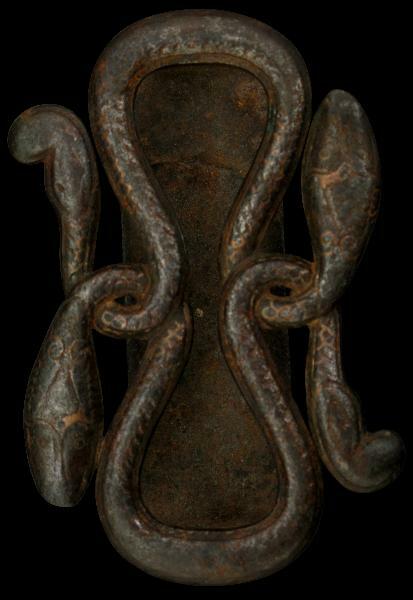 This iron buckle is in the shape of two entwined serpents or nagas. It has traces of silver and copper inlay. 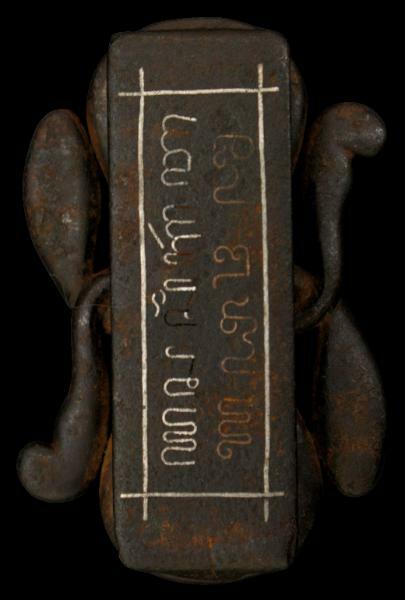 The reverse is inscribed with two lines of Javanese script – one of inlaid silver and the other of inlaid copper, withing a silver inlaid border. Buckles of this type often have an inscription on the reverse but not typically as extensive as with this example. kratons (courts) of central Java, particularly Surakarta (Solo). They were part of court dress for male courtiers. The use of Javanese script began to die out from the nineteenth century due to Dutch colonial influence. Today, relatively few Javanese can read it, mostly they are scholars. A buckle and holder of similar form are illustrated in Richter, A., The Jewelry of Southeast Asia, Thames & Hudson, 2000, p. 189.